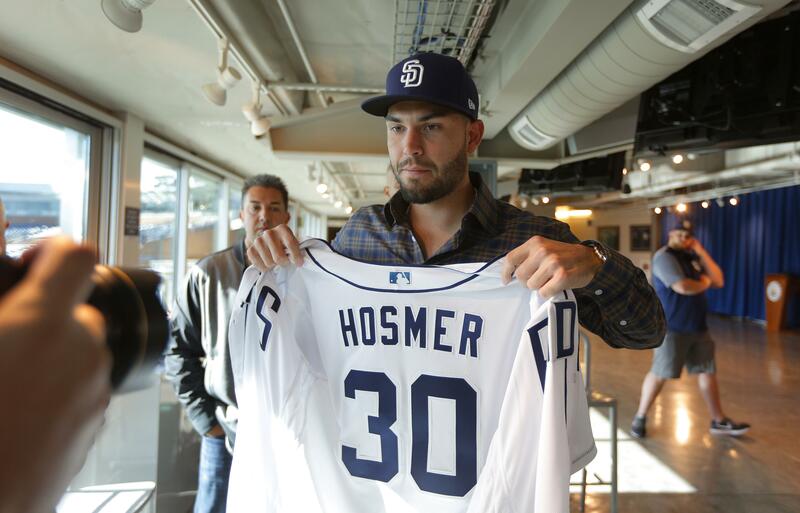 PEORIA, Ariz. – Eric Hosmer has joined the San Diego Padres, and will wear a jersey number to honor late Kansas City teammate Yordano Ventura. Hosmer and the Padres completed their $144 million, eight-year contract Monday night. The first baseman joined the team hours after it held its first full-squad workout of spring training. Hosmer will wear No. 30 in honor of Ventura, a pitcher who died in an auto accident in the Dominican Republic last year. Hosmer asked Padres third base coach Glenn Hoffman for the number. Hosmer has been asked to play a leadership role with the Padres after his experience in Kansas City, where he won a World Series with the Royals in 2015. He said he looks forward to that role having seen the many young players the organization is developing in the major and minor leagues. The Padres did some extensive background work to see how Hosmer fits from a baseball and business perspective with an organization not known for being big spenders the last couple of years. They received a great deal of positive feedback from a number of scouts and baseball personnel people, general manager A.J. Preller said. Published: Feb. 20, 2018, 11:49 a.m.